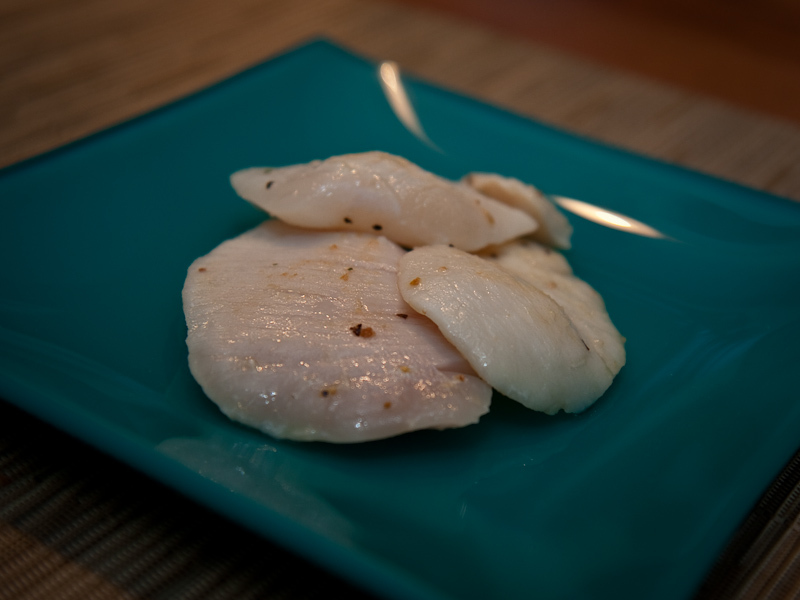 Have you tried halibut cheeks? If you love seafood, it’s a must. These medallions are mild, meaty, a little sweet, and absolutely delicious. I picked up pound of cheeks over the weekend from the Little Fish Company — find them Sundays mornings at the farmers market on 8th and W.
After rinsing the cheeks off and patting them dry, I heated a tablespoon of olive oil in a frying pan. Each cheek got just a dash of garlic salt and lemon pepper before I put them in the pan, cooking the cheeks for only 30 seconds on each side before removing from the pan. You have to be careful not to overcook the cheeks or they become stringy. We enjoyed the halibut cheeks with this Fettuccine Alfredo (the second Runner’s World recipe I’ve recently prepared). Here’s another recipe inspired by “On Rice,” the cookbook I mentioned in my previous post. I took the author’s cream sauce recipe and lightened it up, swapping out heavy cream for milk and fat-free sour cream, which I think gave the meal a tangy, sort-of-stroganoff kind of taste. Something I might try the next time around is using only half a cup of wine, and adding ½ cup chicken broth. 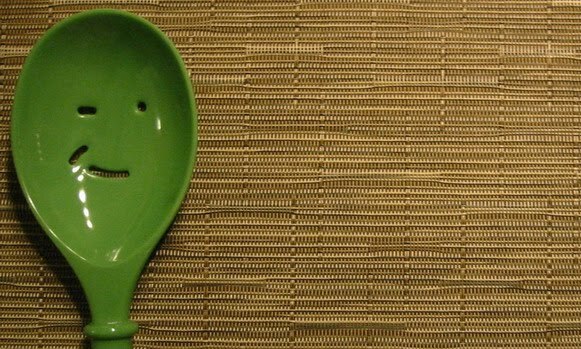 Combine flour, ¼ teaspoon salt and ¼ teaspoon pepper in medium bowl. Toss turkey in the flour, shaking off excess. Heat oil over medium heat in a large nonstick skillet. Add turkey to the skillet and cook, stirring occasionally, until the meat is lightly browned, about 5 or 6 minutes. Transfer turkey to a plate; set aside. Melt butter in skillet. Add shallots, cooking and stirring often until softened, about 1 minute. Add mushrooms, lemon juice and thyme, stirring well. Cover and cook until mushrooms give off their juices, about 3 minutes. 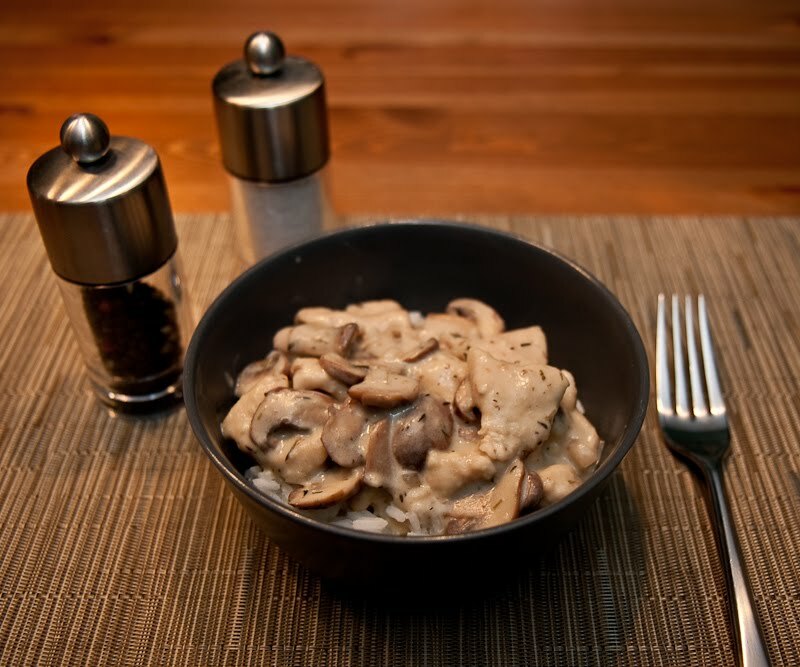 Uncover, increase heat to high and cook an additional 2-3 minutes, until mushroom liquid evaporates. Pour wine into skillet and boil for a couple minutes. Add milk and cook for 7-8 minutes, until liquid has reduced slightly. Bring heat back to medium and stir in sour cream. Return turkey to the skillet and cook until sauce is slightly thickened, just a minute or two. Season with salt and pepper, and serve over steamed rice. Chris and I are trying to mix up our carbs a bit so we’re not shoveling spaghetti into our mouths all the time. 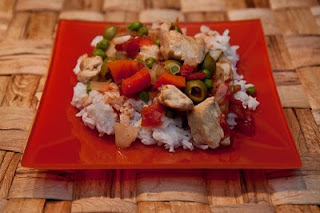 This recipe is adapted from one found in of my oldest cookbooks, “On Rice” by Rick Rogers. I bought it, used at a bookstore in downtown Chico, when I was in college. Although I’ve had this book for many years, I haven’t started cooking with it until recently. I used less oil and broth than the original recipe called for, doubled the garlic, amped up the dried oregano, used smoked paprika (the recipe called for Hungarian paprika) and added some diced stewed tomatoes. Heat oil over medium-high heat in a large nonstick frying pan. Add chicken and cook, stirring occasionally, until lightly browned, about 5 minutes. Add onion, red pepper, garlic, oregano and bay leaf. Cover and cook until the vegetables soften, about 4 minutes. Stir in broth, peas, tomatoes and paprika and bring to a simmer. Reduce heat to low and simmer for a couple minutes, until ingredients are heated through. Season with salt and pepper. Remove bay leaf. Serve over rice. 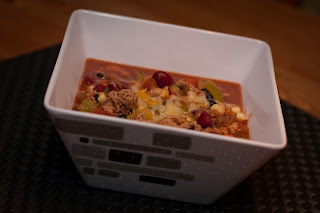 Our friend Lisa recently had a party and served a really chunky, packed-full-of-goodies chili. She was kind enough to share the recipe, which I tweaked based on what sounded good and what I had in the pantry. Brown turkey until just slightly pink in a large soup pot. Add onion, garlic, celery and oregano and finish cooking the meat. Pour contents of cans, without draining any of them, into pot. Add taco seasoning and dressing mix. Allow to simmer, covered, at least 30 minutes, before serving. Runner’s World has a feature, The Athlete’s Palate, which I quite enjoy. Each month you get a different recipe from a cookbook authors and chefs who just happen to also be runners, triathletes and the like. 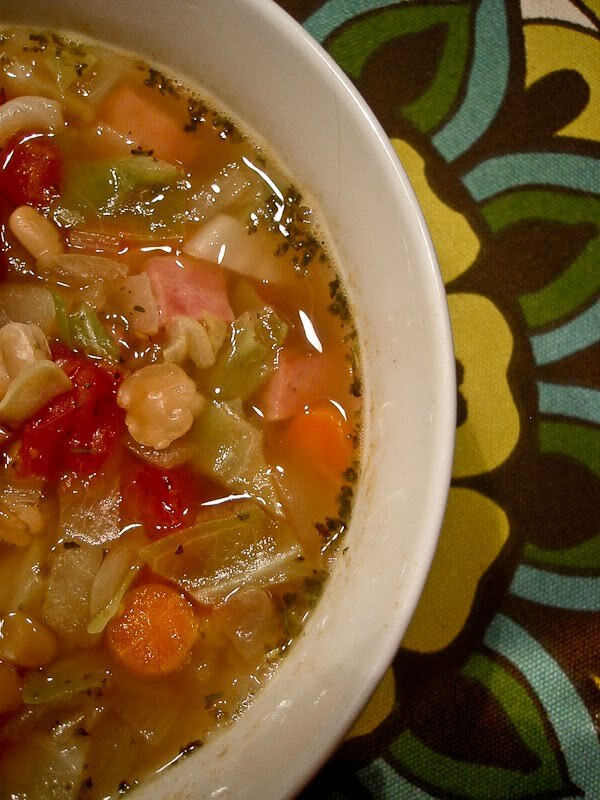 I recently made a soup with all kinds of goodies — diced ham, cannellini beans, chopped cabbage — based on a recipe ripped out of a back issue. I used less cabbage, added dried oregano (I love it in practically any dish) and used turkey ham because of my aversion to most pork products. Also, I used baby carrots where the recipe called for large carrots just because of what was already in the fridge. The soup was quite hearty, and was speedy enough for a weeknight meal. Heat oil over medium-high in soup pot. Add onion and sauté until soft and golden, roughly five minutes. Add Italian seasoning and oregano and stir until fragrant, about a minute. Add remaining ingredients and bring to a simmer. Reduce heat to low, cover pot and simmer until vegetables are cooked, 10-15 minutes. Season with salt and pepper, and serve.